From May 1998 until July 1999 I worked as a corporate pilot in Indianapolis, IN for a limited liabilities corporation that was formed to act as the flight department for a commercial real estate development firm and a large insurance corporation. It was a "typical" small flight department consisting of a Flight Services Coordinator (dispatcher) and three full time pilots. We operated out of an office at an FBO at Indianapolis International Airport. Our fleet consisted of a 1994 Beechcraft Starship (BE2000A), a 1997 King Air C90B (BE90), and a 1998 Super King Air 350(BE350). We also had use of a Beech Bonanza A36 (BE36) that we occasionally used on short trips. Unlike the airlines, corporate pilots don't have a set schedule and fly a variety of trips to many different destinations based on the travel requirements of the parent company. Some companies use corporate aircraft as strictly a business tool and others use the aircraft on a combination of business and personal trips. Corporate flight departments vary on how they handle pilot scheduling. Some corporate pilots are required to basically be on call 24 hours a day 7 days a week with a pager while others have set days off and are not required to be contactable during those days. At my company I was required to carry a pager and be on call but most of trips were scheduled well in advance and I usually knew a week in advance what I was doing the following week. I had no guaranteed off days but it worked out that I usually flew an average of 4 days a week. The flying went in cycles and there were times I would fly 6 days a week for a couple of weeks straight and then there were also times I didn't fly for over a week straight. In terms of hours I averaged 45 to 55 flight hours per month which is generally considered very busy for a corporate pilot. Many corporate pilots fly only 200 to 300 hours per year. Corporate trips can vary from short "out and backs" to multiple day trips. I averaged 4 to 5 nights a month in a hotel away from base. Corporate pilots are also usually required to work weekends if necessary and I generally ended up working around 1 weekend a month. The aircraft a company uses can vary greatly from light single engine airplanes to large commercial type jets.Some of the more common types you will see on a corporate FBO ramp include the King Air cabin class series turboprops, the Cessna Citation series light jets, the Learjet business jets, and the Gulfstream family of larger business jets. Most corporate aircraft today are equipped with modern avionics including GPS navigators, flight management systems, and EFIS flight instruments. In these days of mutlimillion dollar corporate aircraft most companies, and certainly all insurance companies, require pilots to go thru extensive initial and recurrent simulator and flight training. Such training is normally provided by national vendors such as Flight Safety and Simuflite. Most initial training programs last two to three weeks. 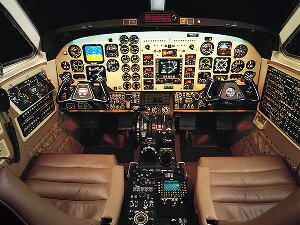 I completed an initial Pilot in Command type rating course in the Super King Air 350 in July 1998. The instruction was provided by Flight Safety International in their Raytheon Learning Center in Wichita, KS(the center of the corporate aviation world). The first week consisted of 3 full days of classroom instruction on aircraft systems followed by 2 days of half ground instruction/half simulator instruction. The first weekend was an "off" weekend for us to do with as we please. The following week consisted of 1 simulator session Monday thru Thursday with an oral exam and flight test in the simulator Friday afternoon. Extensive high tech simulator training is no longer limited to multimillion-dollar turbine powered aircraft. There are several companies that now specialize in simulator/flight training for high performance single engine and light to medium twin engine aircraft. Pilots will typically complete an "Initial" training course as described above when they first begin operating a new type aircraft. Most pilots also are required to attend "recurrent" or "refresher" training in each type of aircraft they fly every 6 or 12 months. Recurrent training sessions are typically 2 to 3 days long and can include a variety of training such as a classroom review of aircraft systems, new avionics equipment, new regulations or procedures as well as several simulator sessions designed to review emergency procedures, and a variety of equipment failures and can also include things such as wake turbulence and wind shear encounters and escape training. Most flight departments require their flight crews perform a variety of tasks and jobs that are associated with the operation of the department other than flying. Many flight departments consist of 1 airplane and only 1 or 2 pilots and in these cases it is normal for the 1 or 2 pilots to run every aspect of the flight department including aircraft/travel scheduling, scheduling maintenance on the aircraft, cleaning and stocking the aircraft, and anything else that needs to be done to keep the department running. In some companies pilots also have other duties that are not related to the aircraft in any way. Some companies will only use a pilot to fly on 1 or 2 days a week and the pilot may work in another capacity, such as salesperson, the rest of the week. Corporate pay rates are based on a number of things, most important being your experience level and type of aircraft being flown. Pay rates vary drastically from company to company and from region to region. As a first year copilot on a light to medium turboprop or jet you could expect to earn anywhere from $17,000 to possibly as much as $30,000 per year. A captain on similar aircraft can earn from $30,000 to possibly $50,000 per year. A senior captain on a large jet(Gulfstream V, Falcon 900B, Global Express) can easily earn $100,000 or more per year. Minimum qualifications for pilots again vary widely from company to company. Usually minimums for a copilot on a turboprop(King Air series) are in the range of 1,000 to 1,500 total hours to include several hundred hours of multiengine experience. Captains generally require something in the neighborhood of 3,000 to 5,000 hours total time, 1,000 hours of multiengine turbine time and experience in the particular type of aircraft.